Gray is a census-designated place (CDP) in Terrebonne Parish, Louisiana, United States. The population was 7,958 at the 2000 census. It is part of the Houma–Bayou Cane–Thibodaux Metropolitan Statistical Area. 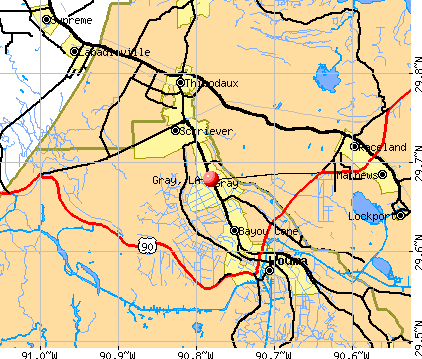 Gray is a census-designated place (CDP) in Terrebonne Parish, Louisiana, United States. The population was 7,958 at the 2000 census . It is part of the Houma – Bayou Cane – Thibodaux Metropolitan Statistical Area . SAVE! See TripAdvisor's Gray, LA hotel deals and special prices on 30+ hotels all in one spot. Find the perfect hotel within your budget with reviews from real travelers. Gray, LA - Peer Comparisons by Rank and Percentile The table below compares Gray to the other 474 incorporated cities, towns and CDPs in Louisiana by rank and percentile using July 1, 2018 data. The location Ranked # 1 has the highest value.